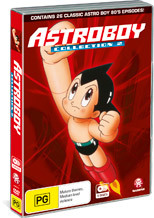 Following the wonderful collection that was released by Madman, Astro Boy Collection 2 completes the next instalment of the 1980 series and once again follows Astro Boy, a robot boy who was created in the year 2030. As a quick recap of the story, Astro's creator Dr. Boynton based him on his son Toby who died in a car accident and as the loss was too much for him, he created a robot to replace him. Unfortunately although Astro was sentient, he was not like Toby and when he made a mistake, he was sold to a ruthless circus operator until he was rescued by Dr. Elefun, a robot advocate. Containing 26 episodes from this delightful cartoon series about a robotic superhero, the series was quite insightful and was also a social commentary about racism and alienation which mirrored the real world. Of course, many of these themes were missed by younger viewers as the action of giant robots and runaway trains was too exciting to miss. Although some people in 2030 considered robots just machines, Astro's family was fleshed out more in the second series which features his sister Uran and his two robotic parents. Of course, Astro has a "brother" called Atlas who makes another appearance in collection 2 and although he despises humans, our young her manages to change his ways. Needless to say, Atlas proved to be a great nemesis for our hero. The biggest difference in collection 2 of Astro Boy is still heavily focused on action, however family is the main theme. Best of all, those classic guest stars return such as Daddy Walrus and the big nosed Dr. Elefun. Even though this current series was created in the 80's, the video and audio quality is rather acceptable and like the previous disc, hearing that famous Astro Boy theme again brought back a wealth of great childhood memories. This is one collection that is great for young and old alike and is the perfect stepping stone into this magical mythology that has produced countless pop culture toys and even a new movie in 2009. Recommended!